I really dug this theme, and the difficulty felt good for a Wednesday. All of the songs used feel like they’ve been around long enough and are big enough hits to be gettable by a good portion of the populace, but the rebus-y aspect of how to enter them takes just long enough to crack – I happened to see the letters for ROLLING from 31A a little farther down than I expected them, and that threw the whole thing open. It took me until the end, however, to realize that all the surrounding words for the theme entries are four letters long, cleanly distributed two to a side. I GET IT now. 4.25/5 stars. This was a fun challenge perfectly pitched for mid-week. I really love the combination of title and revealer on this one. David gives us a very aural puzzle today; all around the edges are sounds clued as the object that makes that sound. 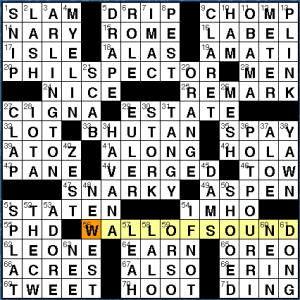 Cumulatively, they make up a WALL OF SOUND (56a, [1960s record production formula, or a hint to understanding this puzzle’s edges]). I especially like SPLAT for [Food fight] and the crossing of DING [Game show] and DONG [Bell] in the bottom right. I’ve never attempted to make a puzzle with an edge theme, but I hear tell it’s quite challenging as you have restrictions everywhere, with the possible exception of the center. Today, in addition to the edge themers, David had to contend with two long Acrosses as well, making his job extra hard. But he pulled it off beautifully, even treating us to ARLINGTON and POTPOURRI. 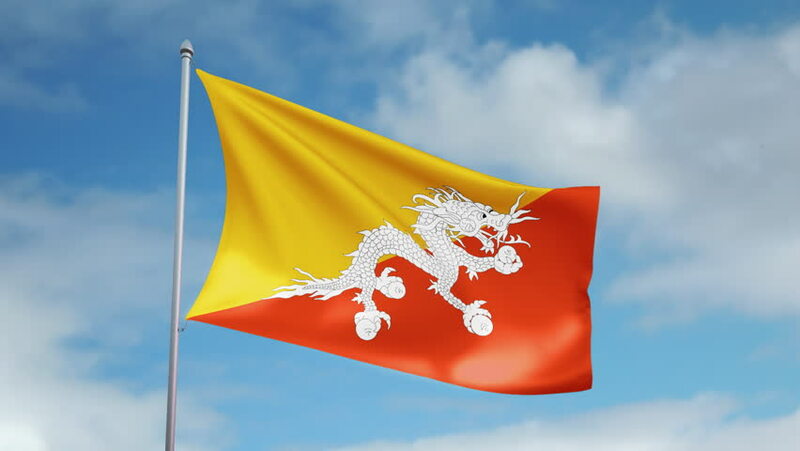 And the center itself is quite nice with BHUTAN [Nation with a dragon on its flag], SNARKY, EULER, STORK, TANGY, ORANGE, and HAVANA. Really lovely! One thing I didn’t know was 4d [Fatty substance in nerve cells]. MYELIN essentially acts as electrical insulation, like the coating on a wire cable. It also would make a beautiful name for a girl! Not much else to say, but again, this is a very nice construction by young Mr. Steinberg, even if I didn’t know exactly what the WALL OF SOUND was or that PHIL SPECTOR developed it. The theme entries are fun and evocative, and the grid is clean and lively. Well done! 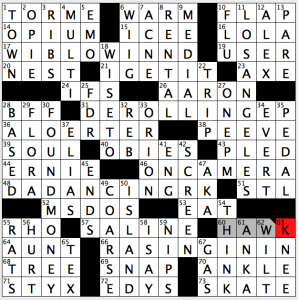 Fill-wise, these are all fine, but the cluing feels just a bit difficult for a puzzle that’s claiming to be the easiest the AV Club gets. 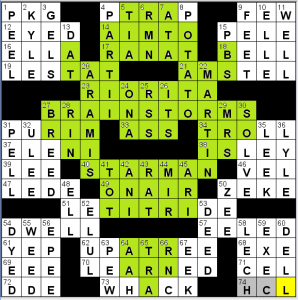 On the other hand, it may just be my own pop culture knowledge failing me here – giving me a line from STARMAN would have made it click instantly for me, but naming its b-side left me using the downs to get a grip. After filling in the grid, there’s still one more step. 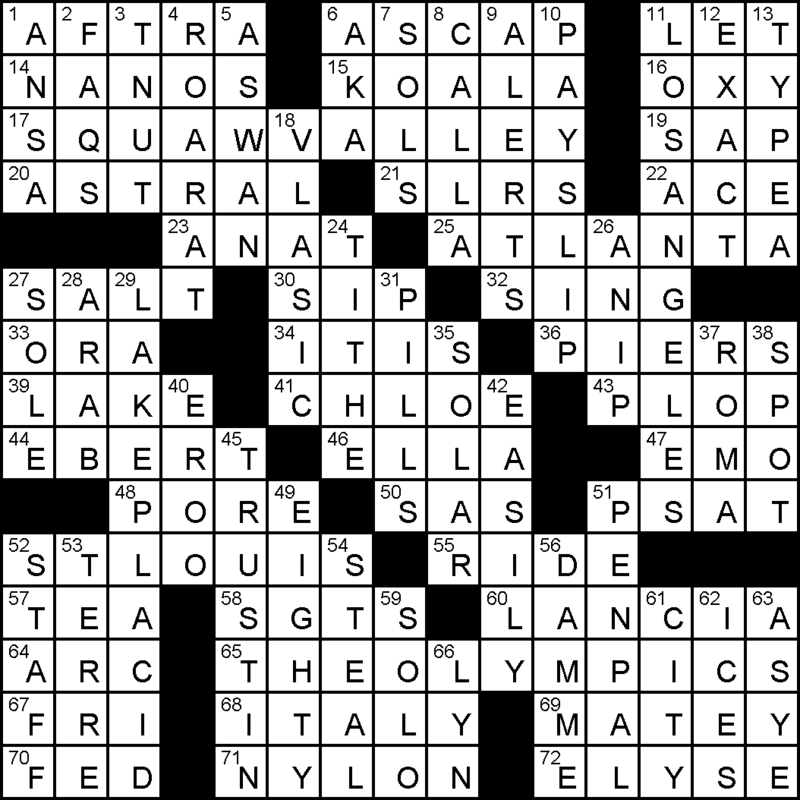 27A is looking for “Idea sources”, and also instructs the solver to shade in the 9 unique letters found in the 11-letter entry. That answer, of course, is BRAINSTORMS, and shading in the squares with those letters gives what forms the rough shape of a lightbulb once the black squares are taken into account. I can see it better with the smaller screenshot to the right – the black squares make a nice approximation of the light bulb’s filament. I might be being a little more picky than I need to be here, but when you tell me 1/5, I expect 1/5. On encountering the first themer, I thought “Oh great, random Olympics venues…” But they form a discrete and complete set, which is definitely more elegant. Most of the theme is symmetrical, with only SALT/LAKE/CITY wedged in awkwardly. So SQUAWVALLEY, LAKEPLACID and SALT/LAKE/CITY (Winter) and LOSANGELES/ATLANTA/STLOUIS (Summer) are the six US Olympic locations. There are two LAKE venues, so that word is duped; I don’t think that’s a problem in such a specifically-themed puzzle, but the two LAKEs intersect at the K, which is definitely inelegant. Break for a Grauniad article on Olympic Venues. The grid is closed in – there are many places where a single black square could wall off a section. At first glance, the short fill seems unusually stodgy for a grid composed of walled-off short stacks, but the large number of theme entries are interfering in most parts of the grid. This entry was posted in Daily Puzzles and tagged Andrea Carla Michaels, David Steinberg, Joel Elkins, Neville Fogarty, Patrick Blindauer. Bookmark the permalink. NYT: Clever theme and excellent execution. It took a while to tumble to it, but that moment of insight is always great fun. I like the clue for Los Angeles. Many moons ago, I lived in Santa Monica and had friends living in Venice when it was still for poor students and hippies. Then Jane Fonda moved there when she married Tom Hayden , and there went the neighborhood. Those little houses that my friends were renting back then are worth millions. One complaint: “Fatty substance in nerve cells” is not correct. Myelin is a fatty substance that SURROUNDS nerve cells. It consists of its own kind of cells that come together in a so-called myelin sheath. 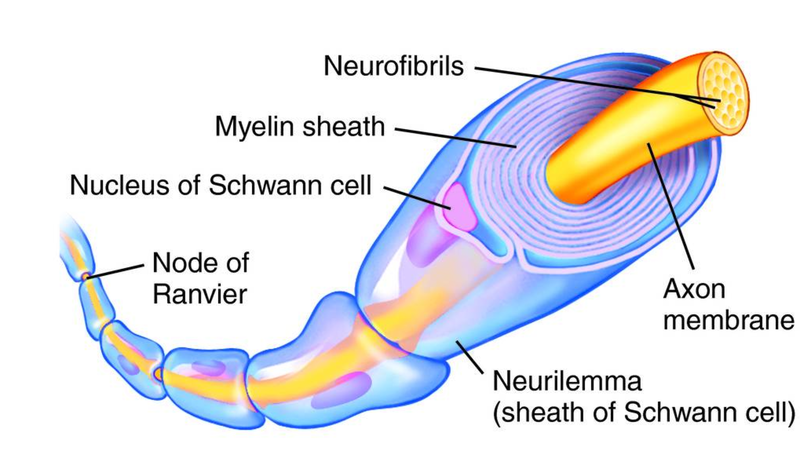 In fact two kinds of cells are involved in myelination– oligodendrocytes in the brain and Schwann cells in the spinal cord (shown in the diagram, with their own nucleus). And Jim, you’re right, it is an insulator but it also does this cool thing of greatly speeding up nerve impulses, in a process called “saltatory conduction” whereby the electrical impulse jumps between the uninsulated “Nodes of Ranvier” depicted in the diagram. You mess with that and nerve transmission is severely compromised, leading to a range of neurological disorders. So, MYELIN is much more that a pretty face and name. Thanks for the great description, huda! I knew someone on the blog would do a far better job of describing it than I could. We’re done having kids, but anyone asking for baby name suggestions from me will get MYELIN for a girl and Ranvier for a boy! Do not understand WSJ 52d THECW. Help? Thanks. Try this: THE CW. “The CW” is the TV network that shows “Arrow,” among other things. It’s short for CBS and Warner Bros. Thanks, Jim. Never heard of it until this grid. In New York, it’s on channel 11, which used to be WPIX. 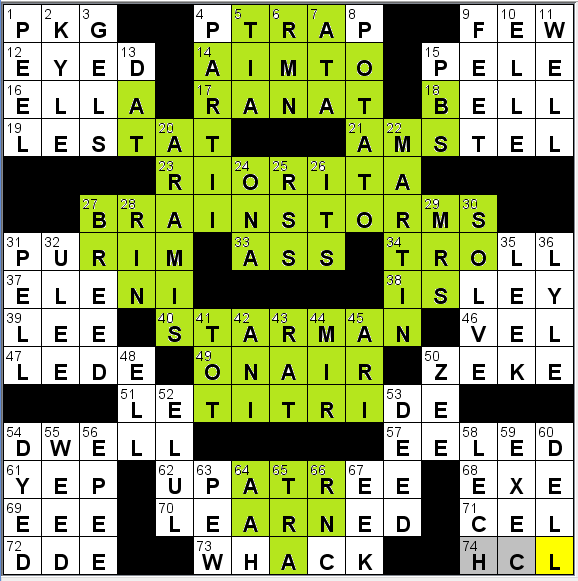 NYT – I recall solving a puzzle with what I think was a very similar theme. Maybe not song titles but “in the” phrases. Not in the past year, but in the past few years. Anyone else recall something like it? Courtesy of Jeff Chen at XWordInfo, this is probably the puzzle to which you are referring. Thank you! And as Jeff notes, today’s execution stands on its own. I agree that the AV Club puzzle was quite a bit more difficult than a 1/5. 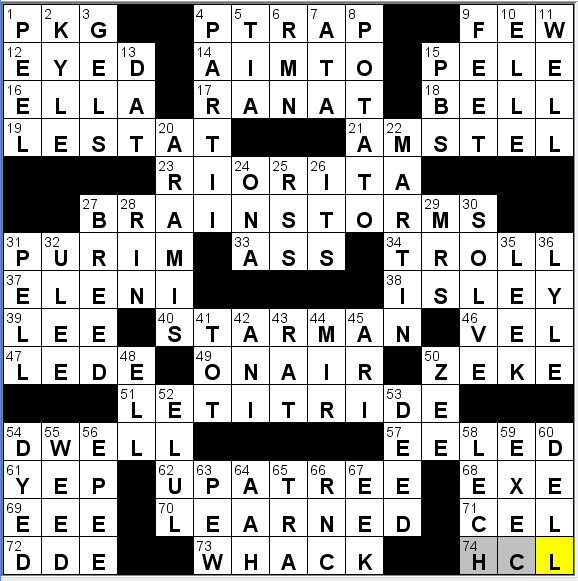 I seem to struggle more with their easier rated puzzles than the harder ones. 6:54 on the AVC, including the shading! a few things i didn’t know right off the bat, but everything was gettable with crosses and i never really got stuck anywhere. the lightbulb shape is very tenuous, but they did the best they could, i guess. i don’t really see how to make it better. on a related note, your monthly puz on your website was fantastic this month! Thanks! I wasn’t sure this one was even possible, so I was happy to pull it off at all. As you might imagine, avoiding such common letters everywhere I didn’t want them was the biggest challenge. Gareth, thanks for the thoughtful write up…it was indeed a random list before Rich Nirris stepped in and suggested it be only the U.S. Cities and even made the grid!!!! The Double LAKE thing was problematic but I love that they crossed if you have to have both! Kudos to Joel for coming up with this timely idea!!! Regarding the WSJ, I didn’t recognize Arrow or The CW either, and I was keeping my reservations about MYELIN to myself, but still: while it’s only a Wednesday in terms of challenge, they don’t get much better in construction and payoff than this. Clever NYT puzzle, but I thought there was sort of an unwritten rule that answers had to make sense on their own as a word or phrase? Have gotten rejections in the past based on that. How unusual is the LOSANGELES in the exact same spot in both NYT and LAT grids? You see those coincidences from time to time with shorter words, but not quite so often with entries of this length.